The CME is not heading directly for Earth. Nevertheless, it is probably geoeffective. According to NOAA computer models, the CME should deliver a glancing blow to our planet’s magnetic field during the late hours of June 21st. 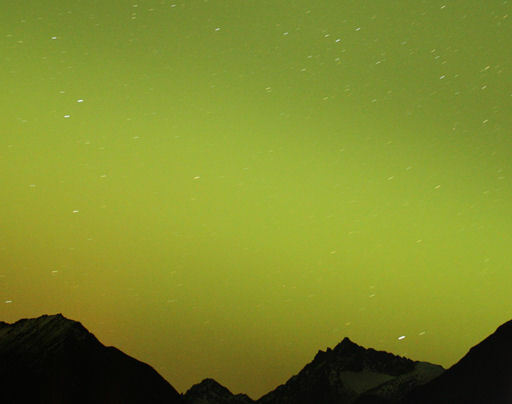 High-latitude sky watchers should be alert for solstice auroras. The CME left the sun traveling approximately 600 km/s (1.3 million mph) albeit not directly along the sun-Earth line. If the computer models are correct, the outskirts of the cloud should reach Earth mid-day on Nov. 10th (Universal Time). First contact could spark a G2-class geomagnetic storm on Nov. 10th subsiding to G1-class on Nov. 11th. NOAA forecasters are citing storm probabilities as high as 75%. These storms in the forecast are mild, not extreme, so there is no danger of power outages or communications blackouts. However, the CME impact could spark some beautiful auroras around the Arctic Circle. The lights might even spill across the Canadian border into northern-tier US states such as Maine, Michigan, Minnesota and the Dakotas. 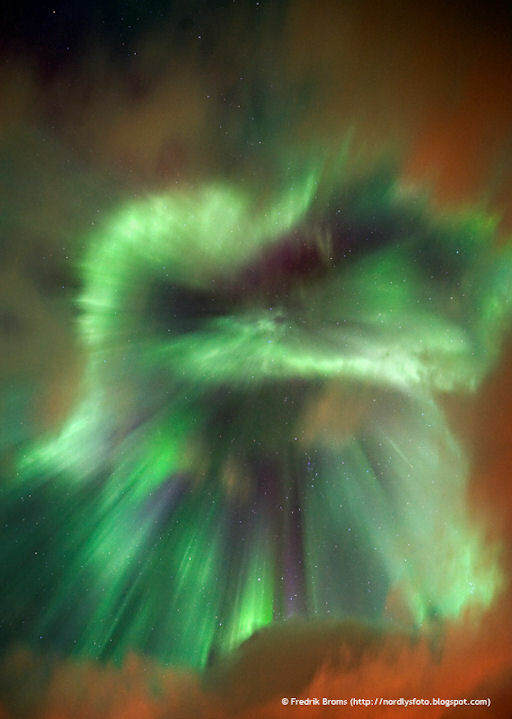 “Half of the sky was green and I stayed out for 5 hours observing the dancing light befor heading home,” says Pettersson. The northern lights take on a weird, rippling shape in a super-wide-angle view captured Sunday night by the Canadian Space Agency’s AuroraMAX webcam in Yellowknife, capital of the Northwest Territories. There’s more from AuroraMAX at the project’s website and on Twitpic. Is it “auroras” or “aurorae”? 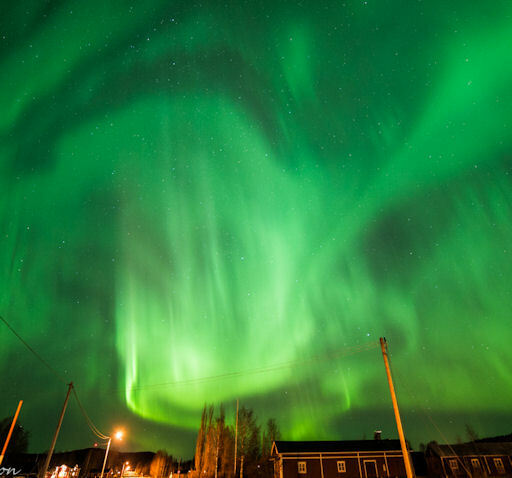 The dictionary prefers the former, but either way, there was a multiplicity of auroral awesomeness this weekend — thanks to a solar storm that swept past Earth’s magnetic field over the weekend. During the past few days, we’ve shown off a few stunning images from Norway and Canada, and there’s a new crop to share today. Auroral lights arise when electrically charged particles from the sun interact with atoms and ions high up in Earth’s atmosphere, 60 to 200 miles up. The interaction sets off emissions in wavelengths ranging from blue, to green (the most common color), to red. The colors depend on the energy of the particles in question. To get the full story on that, check out the explanations from the“Causes of Color” website and the University of Alaska at Fairbanks. This weekend’s auroras were particularly bright because ofa strong solar outburst that occurred on Thursday. There’s an interval between the outburst and the displays because the particles that are ejected from the sun travel at far less than the speed of light. But they’re still pretty speedy — the velocity is on the order of a million miles an hour. Solar outbursts, known more formally as coronal mass ejections or CMEs, have the potential to disrupt electrical grids or satellite communications. There could be radiation effects on astronauts in orbit or passengers on high-altitude, pole-traversing airplane flights. Thursday’s outburst dealt Earth’s magnetic field a glancing blow, and no significant negative impact has been reported. However, an even stronger CME is currently on its way toward Earth and may force the rerouting of polar flights. Once again, electric-grid managers and satellite operators will be on alert, as will aurora-watchers. Bjorn Jorgensen’s view of the aurora was captured on Sunday at Grotfjord, close to Tromso in north Norway. “This was amazing,” he told SpaceWeather.com. “It was a wonderful experience to see these stunning auroras.” The bird-of-prey picture was taken with a Nikon D3S camera equipped with a Nikkor 14-24mm lens. Exposure for the pictures in Jorgenson’s set was ISO 2200 at five and six seconds. Check out SpaceWeather.com andArcticPhoto.no for more views. 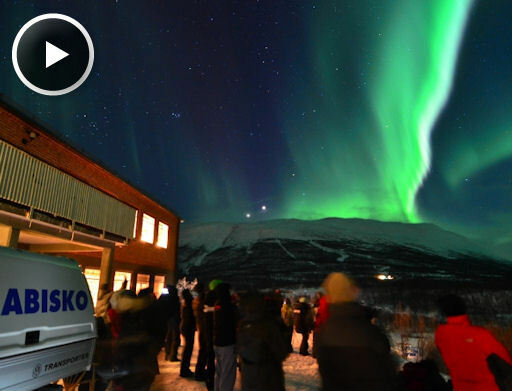 Chad Blakley said on Sunday that he had “an unbelievable night” at Sweden’s Abisko National Park. “As soon as the sun went down I realized that we were about to experience something special,” he told SpaceWeather.com. “The auroras have been dancing all night long and show no sign of stopping! I only came in because 32 gigabytes of memory cards were full and all three batteries were dead!” Click on over to Blakley’s Vimeo page for a time-lapse video version of this imagery, and check out SpaceWeather.com for more from Abisko. Although the eruption was not squarely aimed at Earth, the CME is likely to deliver a glancing blow to our planet’s magnetic field on Nov. 11th or 12th. This could add to the impact of another CME already en route. The earlier cloud was propelled by a filament eruption (movie) on Nov. 7th and is also expected to deliver a glancing blow on Nov. 11th. Analyses of these events are still preliminary, and the forecast may change. For now it is safe to say that high-latitude sky watchers should be alert for auroras on Nov. 11-12. 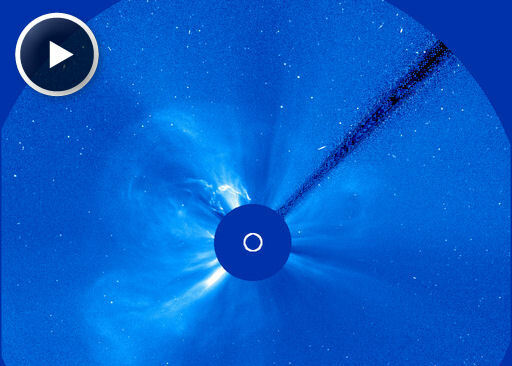 CME IMPACT: A CME hit Earth’s magnetic field on Oct. 24th at approximately 1800 UT (02:00 pm EDT). Acording to analysts at the Goddard Space Weather Lab, the impact caused a strong compression of Earth’s magnetic field, allowing solar wind to penetrate all the way down to geosynchronous orbit for a brief period between 19:06 UT and 19:11 UT. Earth-orbiting spacecraft could have been directly exposed to solar wind plasma during that time. High-latitude sky watchers should remain alert for auroras as Earth’s magnetic field continues to reverberate from the CME impact. The best time to look is usually during the hours around local midnight. “These were some of the most amazing auroras I have ever seen,” says Broms, a longtime observer of the Arctic lights. “The colours were absolutely stunning with purple and deep blood-red in addition to the green. It was a night I will never forget! Sky watchers at the highest latitudes should remain alert for auroras as Earth’s magnetic field continues to reverberate from the CME impact.